This summer didn't yield as many finished projects as I would have hoped, but it sure was a creative one based on the projects that I started and worked on. One revived UFO was an art quilt that I started in 2010. 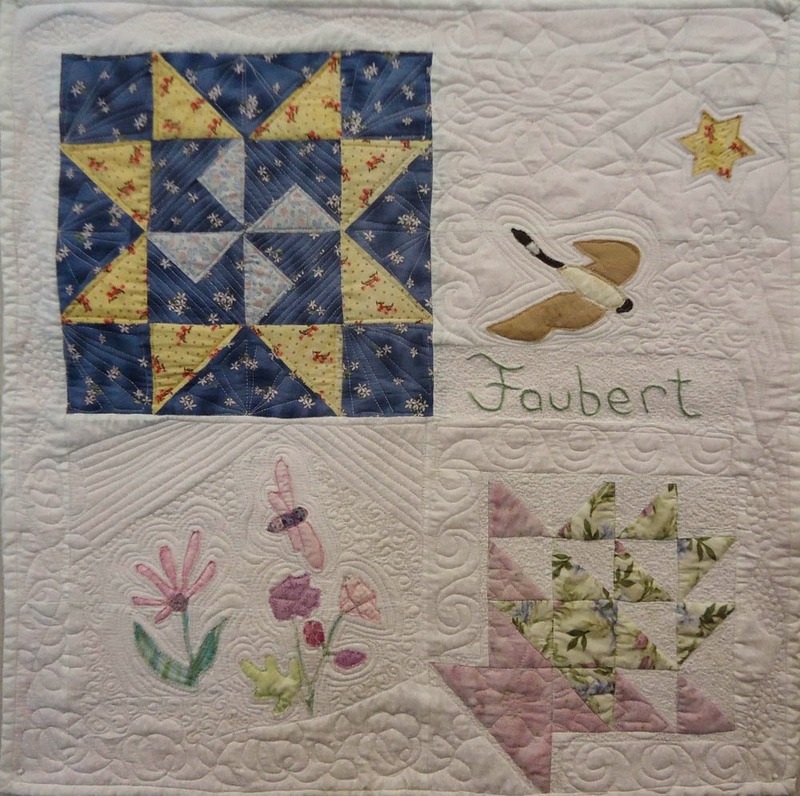 I took a class at Quilty Pleasures on creating an art quilt. When the teacher saw the picture that I wanted my project to be based on, her comment was:"That is very ambitious". That really should have been my first clue! Since that photo was what I had brought, it's what I worked on. 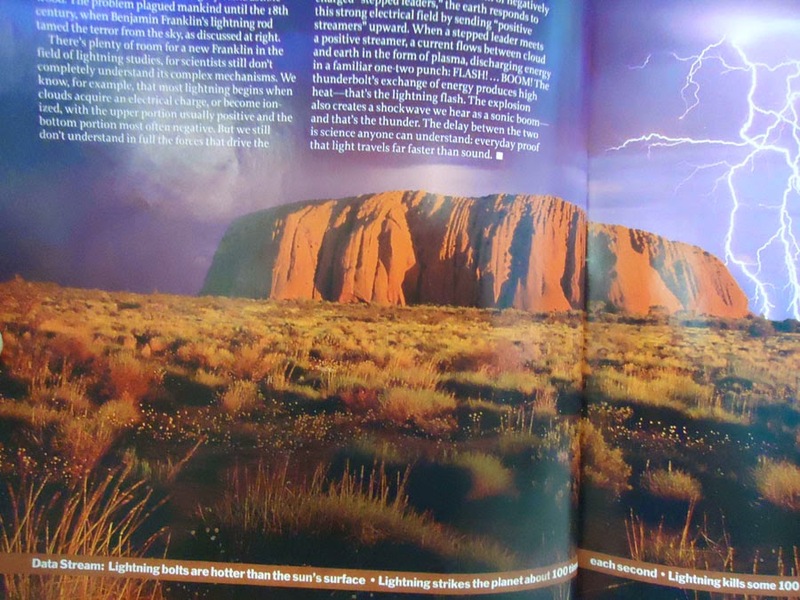 The photo is of Ayers Rock in Australia. It reminded me of the south-west of the US, which we had recently visited. Since I'm the author of my project, it's now the South-West Rock art quilt. Creating the sky and the rock itself wasn't really difficult. The ambitious part is all of the scruffy landscape in front of it. I started working on it but it was beyond my ability, so I left it. However, every time that I would see embroideries or art quilts that resembled my foreground; I took mental notes of how I could accomplish this. You don't have to add one blade of grass, bush or flower at a time. It's possible, and probably best to give the illusion of many blades of grass etc. This is where the couching stitch comes in handy. It's essentially tacking on a thicker thread (like wool) with another thread. If you use interesting wool, it can look like many bushes or patches of vegetation. I took out the project because I wanted embroidery work to do during very long car trips. It's amazing how quickly time flies when you embroider! Actually the first time I embroidered in the car, we were heading to North and South Dakota. It's great that this project is a result of those wonderful car trips and that I'm working on it on other trips. I got about half of the foreground completed going back and forth to Northern Ontario this summer. I'll be working on it during my next trip - which is to China! Between the 15 hour flight and the various buses, I'm hoping to have the project finished by the time I come home. 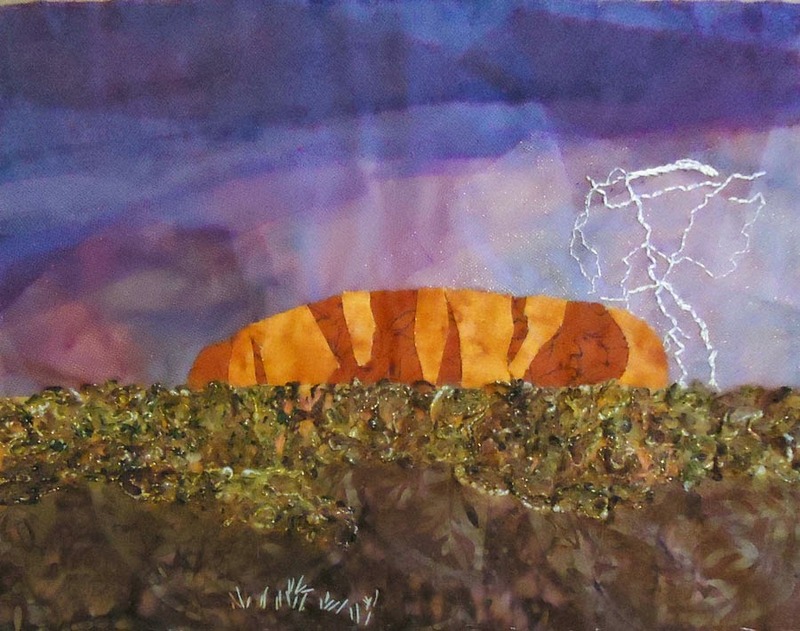 South-West Rock Art Quilt - only the foreground and lightning to finish! About 3 years ago I made my first door hanging. I wanted something on the door that wasn't a wreath - it was either make something or repaint the door (in other words, a no-brainer!) I started with four different panels and incorporated various elements from magazines etc. I found some lovely appliqué of flowers and a Canada goose, so I decided to work around these. That was the extent of my door hanging. I had very little experience machine quilting so I did a little bit of stitch in the ditch and a few wavy lines here and there and called it done. When I made that first door hanging, my intention was to have one for each season. This summer I finished my second, spring door hanging. I had learned many lessons about door hangings by then, so it wasn't white, but rather bright pink, green and orange. Nothing calm about that one! As I've mentioned in my last post, the quilting I do depends a lot on the amount of energy I have in the evenings and on weekends. Low energy this summer has meant that I have watched many Craftsy courses. 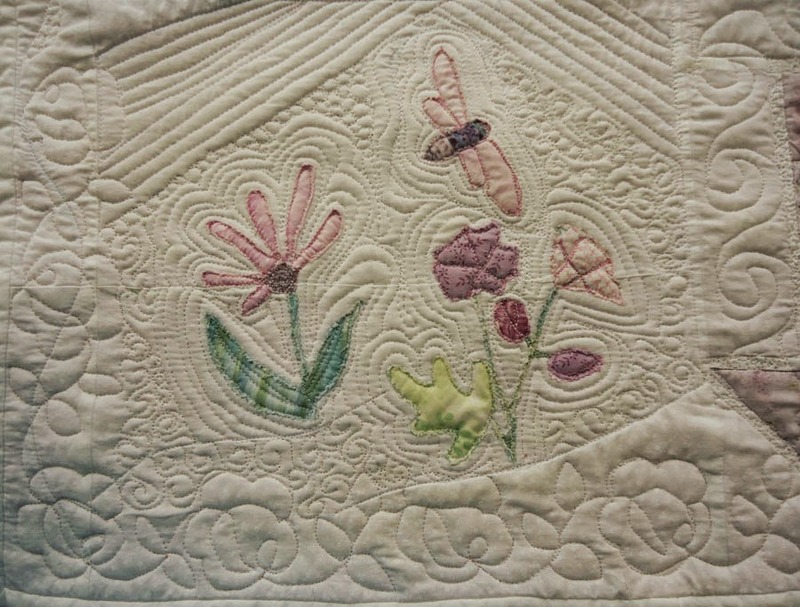 The one that has inspired me the most lately has been Cindy Needham's Design it, Quilt it: Free-Form Techniques. Since I'm always looking for projects to practice my free motion quilting (FMQ) on, I took out that first door hanging. I had nothing to loose. That door hanging had served me well for two years, so if I messed it up, it wasn't the end of the world. I really wish I had taken a before picture. 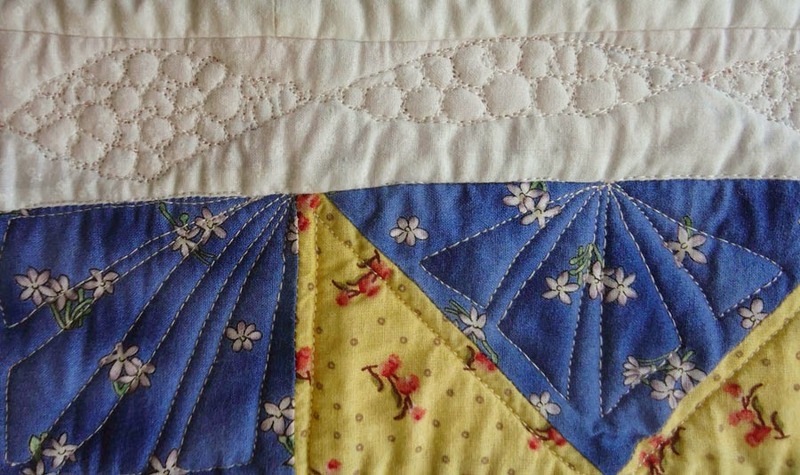 In the photo above, the lines represent roughly the original quilting. As you can see, it was pretty sparse - I just didn't know what to quilt. In the re-quilting, I started with stencils. I used a border flower stencil for the bottom-left side. 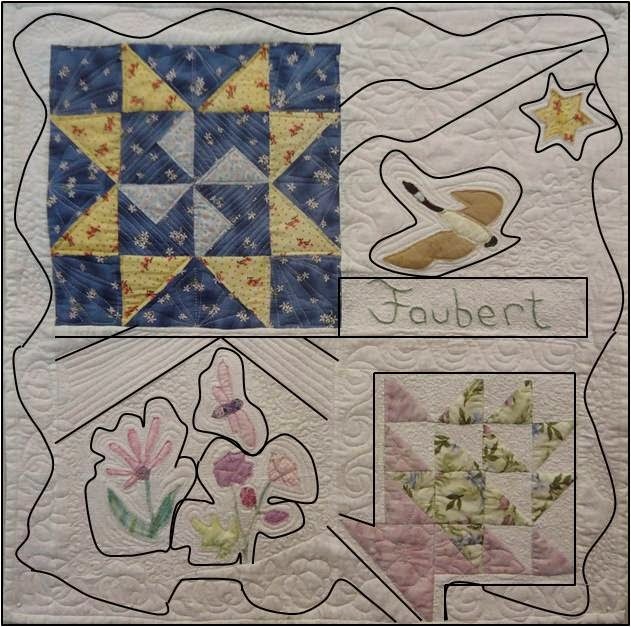 I added a flower stencil on the basket and then a sun, two stars, a fleur-de-lys and a diamond pattern in the top-right. I added echoing around the flowers, dragonfly, the Canada goose and the star. They had already been bordered but the echoing is much more effective. I worked with the original straight lines above the flowers and added more. Swirls were added around the basket as well as to the left of the Canada goose. I scribbled in the white triangles and squares within the basket as well as around the embroidery. That provided lovely contrast. That filled in most of the space. I really didn't know what to do with the rest of the background, so I watched the Background chapter of Cindy Needham's video once more. I figured out that I had to block off the areas that were still blank and work each one separately. Breaking down the area really helped. I also practiced drawing the swirls and the pebbles a lot, so that by the time I started FMQ, my hand muscles knew exactly what to do. As Cindy suggested, I also used my fingertips to guide the FMQ - that was extremely helpful. For the star block on the top-left, I used that trusty dot-to-dot from Angela Walter's Dot-to-Dot quilting technique. I didn't want to distract from the design, especially for the windmill in the middle of the block. I thought that I would really dislike making repetitive designs such as swirls and pebbles. It was very tedious before I got the motion down, but after that, it was really enjoyable and very Zen. Not at all what I was expecting! A WHITE door hanging is NOT a good idea. I knew that it would be subject to the elements, but I didn't realise that it might blow away and land in the garden. Darker or brighter colours are much better suited to door hangings. I am very happy with the results. The only thing I would do differently the next time is to plan out the stencils a little more. Most were fine, but I overdid it in the top-right panel. 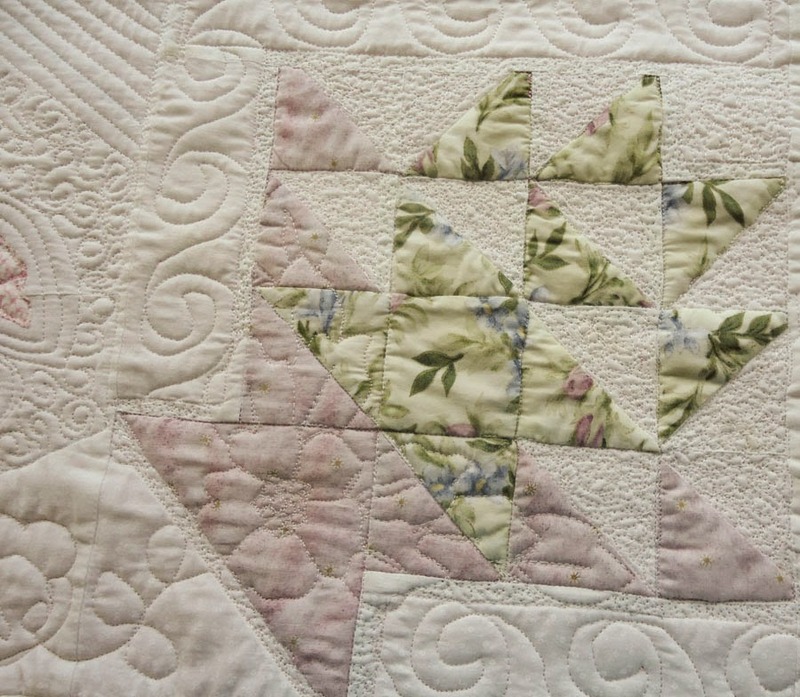 Cindy Needham says that we should have movement, depth, and light and shadow in our quilting. I think I'm getting there. I shared this post at Sarah's blog, Confessions of a Fabric Addict for her Whoop Whoop party! and Link-A-Finish Friday with Richard and Tanya Quilts. Check out the fun.